Let's start by defining data governance. According to wikipedia (because wikipedia knows all), "Data governance is a control that ensures that the data entry by an operations team member or by an automated process meets precise standards, such as a business rule, a data definition and data integrity constraints in the data model. " So at the end of the day, an organization's data governance policy is specifically created to standardize the data model to improve operational efficiency. If you are given a project where you need to create a database schema, tables, columns, etc, you have your recipe in order to complete the task by following the data governance policy. However, the recipe is only as good as the cook who is creating it. Data governance isn't a 'glory' topic. In fact, it's quite the opposite! Developers (database, application, etc) and DevOps absolutely hate projects that involve implementing or following an organizations data governance policy. Why? It's time consuming and some standards they may not agree with (to name a couple). Would you rather have the policy up on your monitor while you are creating a new data feed or create the feed as quickly as possible? I would venture a guess that you go with the latter because it's more realistic in today's pace of business. What if you work for an organization where it's required by law? Some data governance policies are put in place to satisfy regulatory laws. Think about financial companies. We need a policy for maintaining data for banks, lending, and stock markets for handling sensitive data. Have you thought about trying to implement a data governance policy and failed? Perhaps you implemented your first data governance policy 5 years ago. I bet you that the policy isn't being followed for all of your data systems. There are decisions made everyday that break data governance policies and almost no way to detect these small violations. I have a perfect solution that you never would have thought of. Use CloverETL to define your data governance policy! Most people think of CloverETL as a data integration software tool and not something that CloverETL could handle. But think of this this way. Your data governance policy is the set of business rules that you create graphs for and the data that you are validating is actually the structure and syntax of your data systems. You can use CloverETL to validate all database schemas that were created on your operational systems and then report data governance violations for the structures. Better yet, run the solution on the development and QA environments so that you catch the governance violations before they even touch production. So what can CloverETL do for you? 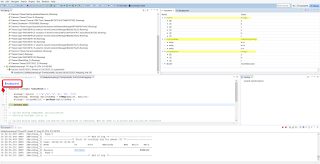 -Check all syntax for data systems including: database naming conventions and data types. -Validate the structure of your data based on your business rules for data. -Verify and report on user access to databases for each of your operational databases. CloverETL can -Monitor the quality of your data. The solution can run daily, weekly, monthly, yearly or any other interval you deem relevant. This is a great use case and policy to automate because once you spend the time upfront automating the process, you can enforce the policy without much effort. If you have any questions about data governance with CloverETL, please don't hesitate to reach out. Do you have PDF files that you need to be able to read and process data from? In most cases, this is a nice thing to be able to do with an existing toolset rather than have to purchase another tool to translate PDF's into a machine readable format. In this blog I will show you how to read PDF's from within CloverETL and hopefully you can apply that knowledge to any other data format that isn't supported as an 'out-of-the-box' feature with CloverETL. First, let's take a look at a portion of the PDF. Looking at the PDF, you can see that there's 8 columns that we need to be able to read: Description, Item#, Seg, Seq#, Len, DT, Rep, Table. If you have looked at something similar in the past, you know that you cannot read this file with an existing CloverETL out of the box component. 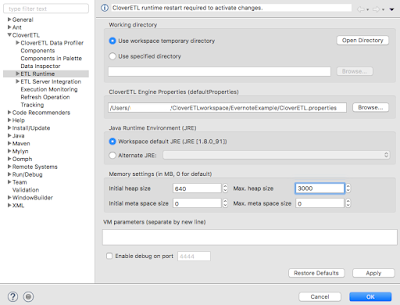 However, CloverETL ships with a CustomJavaReader component (as well as CustomJavaTransformer and CustomJavaWriter) which easily extends the CloverETL Engine's capabilities by custom coding Java to fit your requirements. There are a few pre-prequisites for being able to do this that depend upon the problem that you are solving. build path so CloverETL knows where these libraries exist. We recommend placing the external .jar files in the lib/ so that all developers and operators are in agreement of the placement of the jar files. 2. 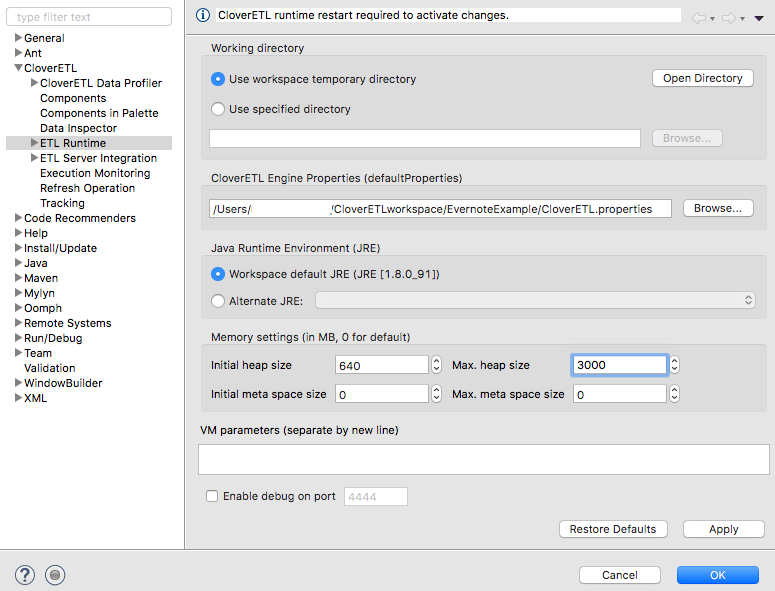 Rather than building your own java class, I would recommend starting with the template that CloverETL provides for reading, transforming, writing data. Open the Algorithm property for CloverETL to create a Java class for you that you can edit directly in that pop-up editor, or you can copy/paste the contents into a separate Java file within the designer. 3. After you have developed your custom reader, you can configure the CustomJavaReader to use your newly created Java class. The configuration depends upon which option you selected above. If you created your own class outside of the component, you can use the Algorithm class property to configure your CustomJavaReader. 4. Create the rest of your graph as your requirements dictate (my example is less useful because I am only showcasing that you can read PDF's with CloverETL). If you would like to see the custom java code or graph used to create this example, I would be more than happy to share it with you. However, using this approach, you can quickly read any format that CloverETL cannot natively read and stream it into a graph or jobflow as you would for any other input data. I couldn't resist updating the blog with the latest features that CloverETL is releasing in the coming months for the production release. We'll call this a review of the CloverETL 4.4.M1 that is available to all existing customers in a test release only. It is not advised to upgrade your production systems until the full release of 4.4.0 is out. 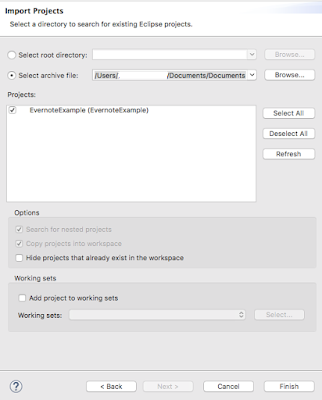 Remote file event listener (out of the box functionality added)!! 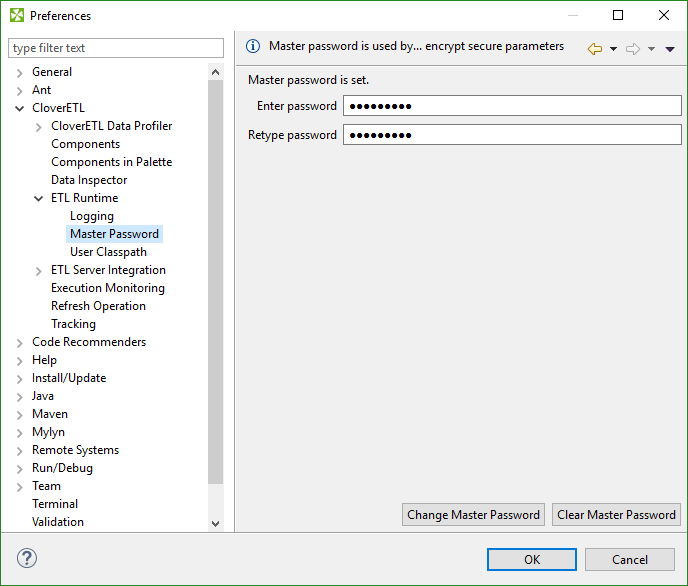 Yes, it was possible to handle remote file event listening prior to this update, but now, you can setup a file event listener for remote servers simply by configuring the server configuration (and reacting to the event in any way necessary). Listener for failed listener - This is quite interesting and pretty easy to use. You can now configure 1 failed listener to listen for any failures in event handling/scheduling and react to the scenario. They are allowing for wildcards and matching of all events setup, or you can setup failed listeners for individual events configured on your CloverETL server. For example, if you have an event setup to grab a file from a remote FTP site, but your network becomes unresponsive. The failed listener can notify you that you have a failure contacting your event source when attempted to retrieve file changes when attempting to execute a file event listener and will allow the user to have a quicker response time to the outage. 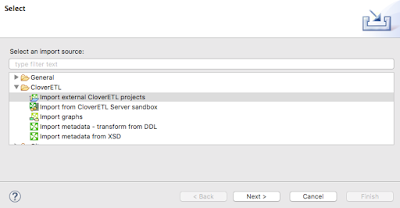 If you are not aware, CloverETL has created a connector to Salesforce and is available in the production release of 4.3, however, the latest milestone release has seen a number of improvements using the Salesforce Connector. 1. 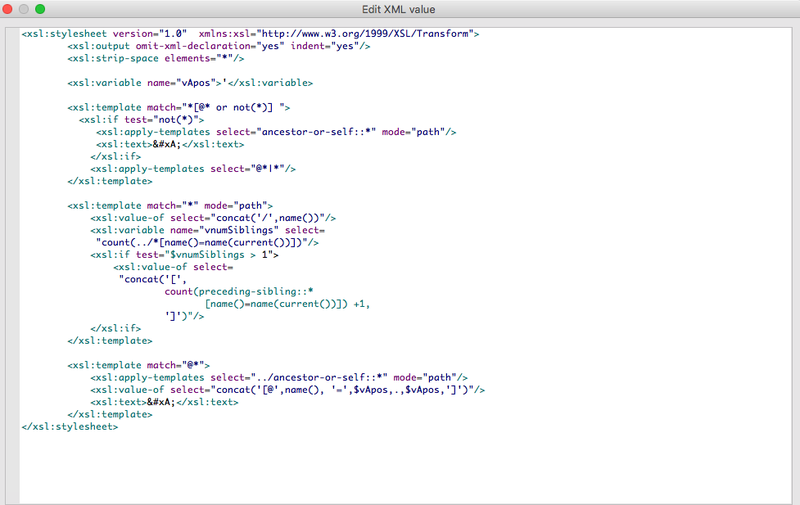 Included a new Salesforce Writer using the SOAP API. This will allow you to write data into Salesforce which are considered micro batches. However, if you are working with large data sets being migrated into Salesforce, it is recommended that you use the Bulk API writer to limit the number of API calls required from Salesforce. 2. Updated - Milestone M2 will include the Salesforce SOAP API Reader. 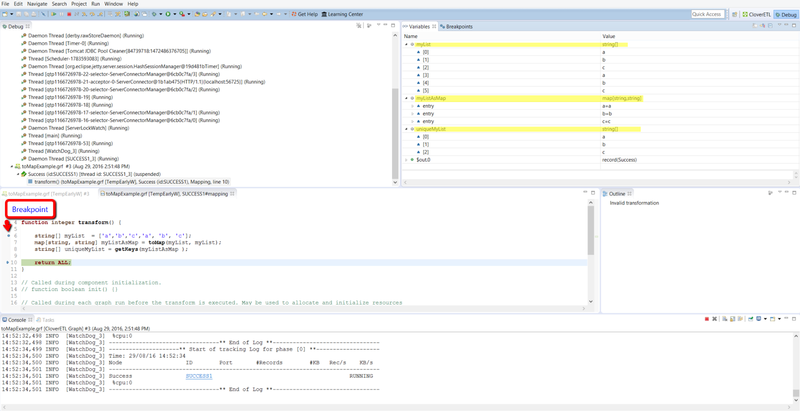 This will allow for subquery's as well as function calls directly in your SOQL query. 3. A more user friendly SOQL editor which will sort all objects and fields for the objects. This makes it much easier to search and find the appropriate object. -Redshift driver bundled with CloverETL Designer. This will now ship with the product so you no longer have to setup your own driver in Designer. -ParallelReader support has been added for S3 so you can now read data from an S3 bucket in parallel and improve performance. You might know that if you need to get only unique records by some key value you should use Dedup component in CloverETL. But what if you have CTL variable as a list and you would like to get only unique values? CloverETL contains couple of standard data types that you can use in CTL (Clover Transformation Language) programming. I will focus today on "list". List is a container for multiple values of same data type. Eg. you could have list of strings, list of integers, but not list of strings AND integers. To be more precise, list is a ordered sequence of elements, where elements could be accessed by their position only. List container is omnipresent in almost all programming languages. In PHP they call it Indexed Array, in Java you might be familiar with ArrayList implementation of AbstractList class and you can find "list" in Python too. And there is a lot of helpful Container functions. CloverETL's list doesn't have any uniqueness enforcement, it is not for example Java Set. So it might happen that there would be multiple same values. You can use in CTL similar trick to get only unique values from list as you might know from different languages. You will convert list to map (set of tuples, "key" => "value" pairs) and get only keys from this map. 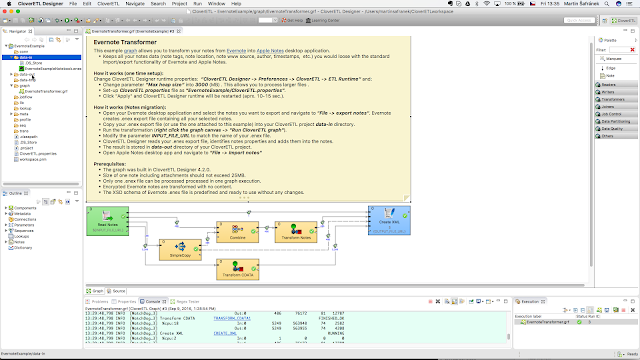 Conversion to map will take care of duplicates automatically as CloverETL's map can contain only one value per key. Second signature expect 1 list and 1 value, this value would be automatically assigned to all keys. You can use printLog() funtion to check content of variables (used in commented lines with '==' which denotes what is expected to be in the variable) - values will be printed into log during runtime or new functionality in CloverETL 4.3.0 called CTL debugging. I hope this short blogpost showed you something new and useful, all comments welcomed. See you at next "How to" article :). Imagine this use case: You have an Excel file with dynamically changing number of Sheets, how you could get list with names of all sheets? 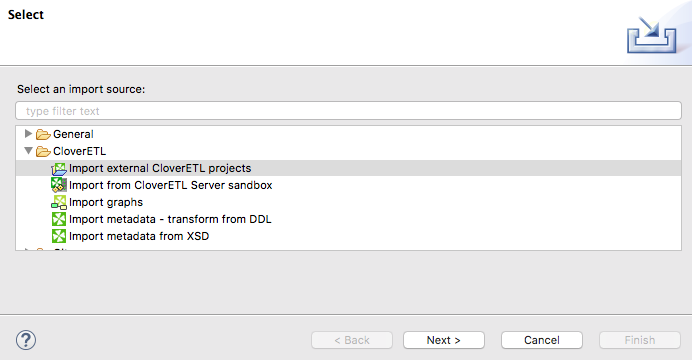 You might know that in CloverETL there is SpreadsheetReader component that can read .xlsx, .xls files. 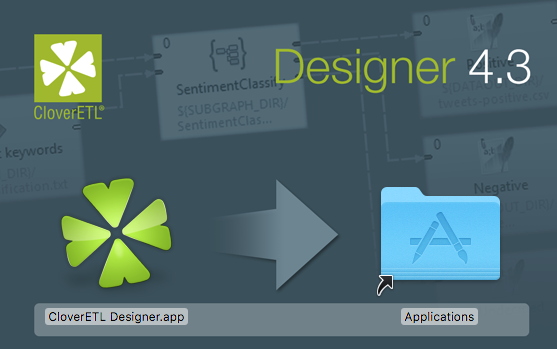 You know that you can use its graphical view to map content from an Excel file to a metadata. You might not know that you can read from multiple sheets with same SpreadsheetDataReader. 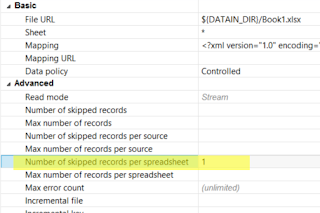 It has one requirement though, all sheets need to have same looking records, there is no way how to use single SpreadsheetDataReader to parse records with different metadata! You can use wildcards '?' and '*' in Sheet property of a SpreadsheedDataReader to specify multiple sheets to be read. So '*' character in Sheet will be first step of our example. Next step would be creating metadata and mapping. To get list of all sheet names you need read at least one record from the sheet. 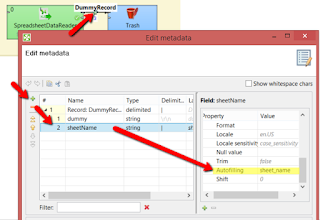 The value is not important, so I created metadata called DummyRecord with 'dummy' field. I am using this metadata in Mapping property editor where I select A1 column as a source as I expect this cell will always contain something. I used "Map by order" button to map content of A1 to "dummy" field and "Data offset (global)" set to 0 - this is to read value directly from A1 cell, other way component would read data from A2. Notice orange label of A1 cell and yellow label of A2 before you set Data offset (global) to 0. Orange means header, yellow denotes first line of data. After this step we would read content of A column from all sheets in our excel. But we need only one record per sheet. Luckily there is Advanced property just for this: "Max number of records per spreadsheet". No I have 1 record per sheet. But still no sheet names! You might notice that there is no functionality inside of Mapping editor to pull sheet name. 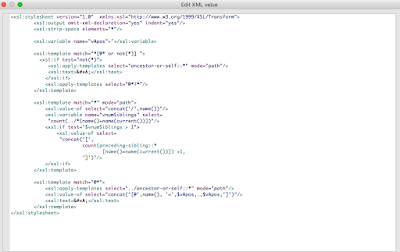 For that we will use Autofilling property in Metadata. Autofilling property is handy feature that creates 'virtual' fields that are not in source. These fields are filled automatically from list of possible configurations. 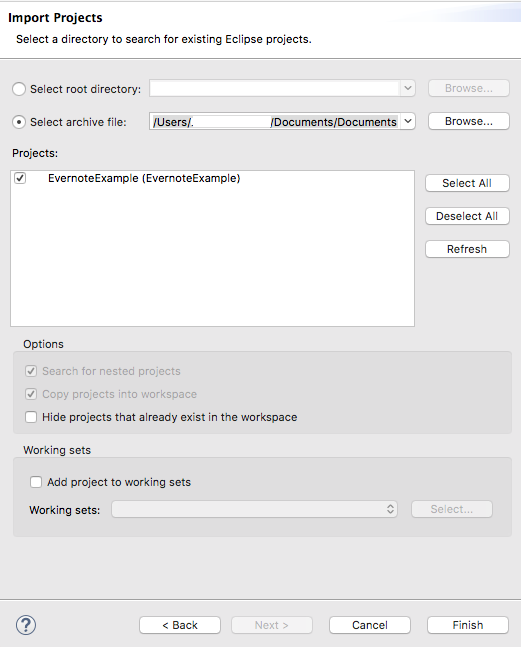 Fields with configured Autofilling property could carry information for example about order of the record in the file, name of the source file or sheet name. And that is exactly what we need! Lets go to metadata editor behind SpreadsheetDataReader, add there new field, name it originally 'sheetName', name of the field is not important, Autofilling property is. For that select newly created field, scroll in right column to Autofilling property and choose sheet_name. Finally I have 1 record per sheet with its sheet name. I decided to make this fancier, so I wrapped this functionality in Subgraph, parametrized File URL property of SpreadsheetDataReader to select parsed file more easily. I created new metadata without dummy field in the subgraph and used Reformat to convert records between these metadata. Result is generic subgraph component that produces list of sheet names from selected excel file. I highly recommend check CloverETL documentation about Autofilling property: http://doc.cloveretl.com/documentation/UserGuide/topic/com.cloveretl.gui.docs/docs/autofilling.html , it is not so known feature that could help you if you know about. What does legacy data software mean to you: old software that’s currently outdated or existing software that works? Or, I should ask, are you a developer or a business stakeholder? No matter which side of the discussion you are on, replacing legacy software is always a difficult conversation between developers and business stakeholders. On one side, business stakeholders see little value in developing a solution for something that is already working and generally follow the motto ‘if it’s not broke, don’t fix it’. Whereas, developers are maintaining the legacy software on a day-to-day basis (and they most likely haven’t designed nor developed the software) and are always looking for ways to improve the software. As a developer, I always see the value in upgrading your software because technology is constantly changing and evolving. The requirements and constraints your systems had 3 years ago are no longer constraints in today’s world. Today we’ll outline an existing legacy system process and software, and show that it can easily be migrated into a data integration solution using CloverETL. I used to work as a government contractor at the National Oceanic and Atmospheric Administration where my job was maintaining and enhancing the data ingestion system. The data ingestion system, at a high level, gathers water level data from NOAA tide stations and transmits them to local read-out ground systems where the data ingestion system would then acquire the water level data for processing. Once the data arrived on the data ingestion servers, software would decode the messages, calculate the water level value based upon the raw data, and insert the data into the database. Can you count the number of software programs that were needed for this process? Disregarding the upstream software, there is a special scripting language that acquires the data, a Fortran program to decode the messages, another Fortran program to quality control and add offsets, and a C program to insert the data into the database. Do you know how to code in Fortran or compile Fortran code? Making a change to these programs takes weeks to fully compile and test. This is a huge problem with maintaining legacy software because the technology is outdated, the business requirements are not fully understood, and costs too much money to enhance the existing software. Wouldn’t it be nice to consolidate all of the software into a packaged solution that can be easily customized for your data needs? Using CloverETL, you can design your solution to follow the same process that’s already in place with the same check-pointing that exists in your system today. Using CloverETL, it’s possible to achieve the same results with the same process flow that you have already defined. This is one example from my previous experience where I know CloverETL would help to make a difference for business stakeholders and developers. Please let me know if you have any additional questions.